As adults, we are more than aware of the power that music has on our lives. It has turned many dull moments to happy memories and gave us a renewed perspective on life. As much as possible, we also want our kids to experience the same—if not more. In this post, we ask that you join us as we explore the wonderful world of boomboxes for kids. Should You Buy Your Kid a Boombox? 2. Auna Roadie Multi-Color Boombox by Berlin Brands Group, Inc.
A boombox is an all-in-one stereo system that boasts the power of home speakers and a portable music player combined. It can either be battery-powered or plugged into a wall socket depending on the needs of the owner. 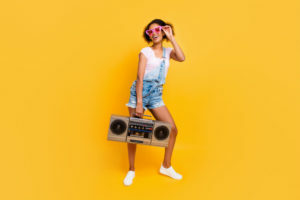 While it has been around for decades, a new version of this indoor and outdoor party-favorite is currently dominating the market—boomboxes for kids. This kind of boombox is designed to be easy to operate. Most boomboxes for kids come in interesting and exciting exteriors with vibrant colors—some even feature famous characters from movies and television shows. Since they are manufactured to entice the young market, these boomboxes are often equipped with a sturdy and shockproof case to withstand repeated and harsh battering. These days, it is not an unusual sight to see young children slouched and totally engaged in their own smartphones and tablets—some use it as an educational tool while others use it for entertainment. However, it can be too big an investment for some parents to buy their kids these devices. There are also parents who consciously choose not to buy one because of the fact that owning these kinds of devices is a big responsibility both for the child and his guardians. As an alternative to this somewhat pricey gadgets, more and more parents are buying their kids boomboxes. With that in mind, do you think it’s worth it? To help you figure that out, we have rounded up the pros and cons of buying a boombox for your kid below. As we have mentioned earlier, music can do many great and unimaginable things for humans. Thus, when your kid shows even the slightest interest in music, it would be wise to support him and buy him a music player that is portable, durable, and functional. In case you’re not aware, kids suffer from stress too—what with all the school stuff, after-school activities, and whatnots. That being said, a boombox might be the answer that will give him the peace and quiet that he needs. Moreover, he can also find a source of inspiration and motivation through the right choices in music. Children, even toddlers, should be taught not just how to value relationships but also how to take care of his possessions. Giving him a device such as a boombox would teach him how to become responsible for the things that he uses and owns. Yes, we love our kids to bits—that’s an absolute fact. However, in all honesty, being forced to listen to the theme song to Disney’s Moana or Frozen all day long is not something most parents look forward to. 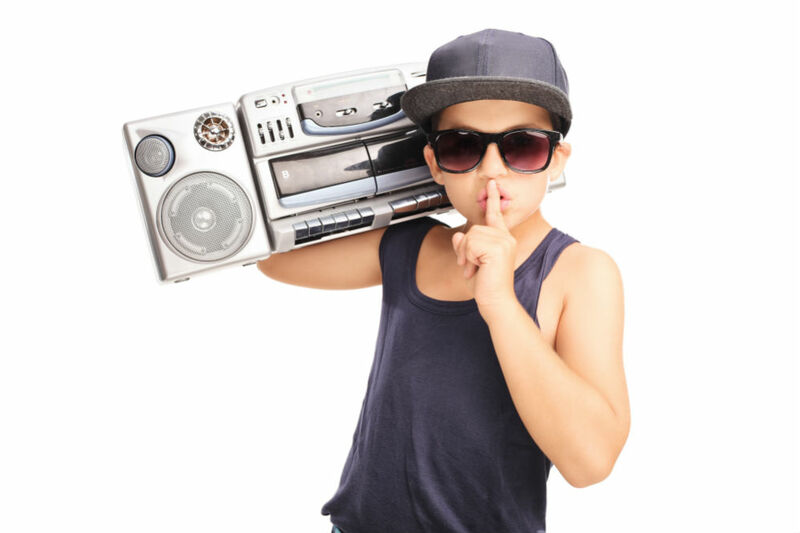 Having laid out all the advantages and disadvantages of buying your kid a boombox, do you think you’ll go for it? If yes, then read on! In the next section, we’ll share with you the tips on how to select the best boombox for kids. 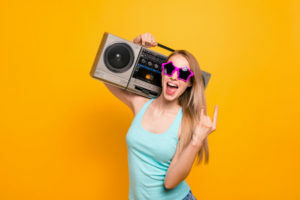 Before you can choose which boombox model to buy for your child, it would be wise to first educate yourself about the features that you should be looking for when buying one. Check some of these features below. While most kids boomboxes are created more as a tool to entertain young children than provide listening pleasure, the quality of the sound it produces should not be taken for granted. For that reason, you would want a boombox that features quality audio technology so that it delivers a rich sound that can fill an entire room. The truth is that in this day and age of digital everything, we feel that we always need to be connected to the web in one way or another. The same thing can be applied to boomboxes. 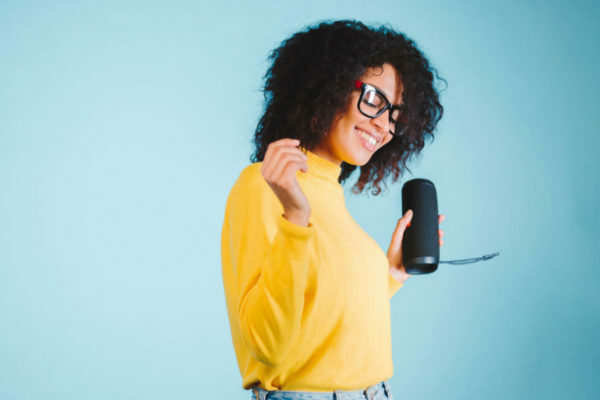 When buying one for your kid, you might want to choose a model that can play different audio formats such as those recorded in cassettes, CDs, and digitally. In that way, your child is given the most options, and he can choose which one is the most convenient for him. 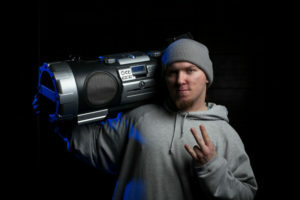 As stated above, boomboxes can run either via the use of batteries or connection to a wall socket. When looking for cordless ones, make sure that the item you are going to buy will have a long battery life so as to provide your kid with the best listening experience. Boomboxes are equipped with handles that allow them to be easily transported from one place to the next. When selecting a boombox for your kid, you would want to ensure that it is lightweight enough that a child can carry it. In addition, you also want to make sure that it is made from durable materials so that it can survive even the harshest of handling. There will be times that your kid wouldn’t want to listen to his own tracks. 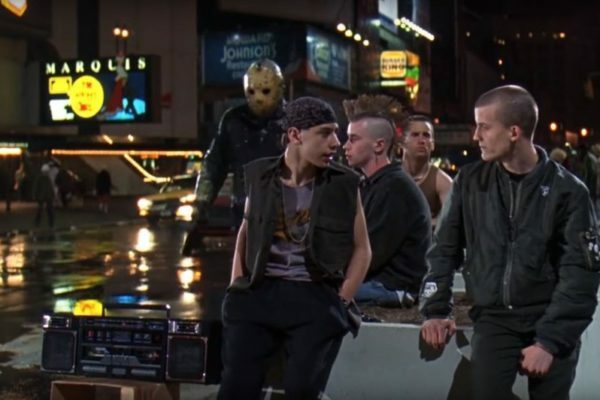 Thus, it is vital that his boombox comes equipped with an AM/FM tuner. By listening to records on the radio, he can broaden his music scope and open his ears to new sounds. Does your kid adore Frozen’s Elsa and Anna? Then this sing-along boombox could be the perfect gift for them! It was designed and manufactured by eKids, a global brand with over six decades of experience in the consumer electronics industry. This boombox can surely bring fun for toddlers and young children alike. The recommended age is anywhere between three to 15 years old. Working microphone: Let your kids sing along to her favorite tunes using the real, working microphone that is connected to this boombox. It comes with a three-foot-long cord that would allow your child to move freely even when holding the microphone. Built-in music: This boombox comes with three built-in songs from Disney’s Frozen, namely: Let It Go, In Summer, and For the First Time in Forever. You can either play it in demo mode, which plays only a part of the song or you can listen to it from beginning up to the very end. Compatibility: Listen to any song you like by directly connecting this boombox to your iPod or MP3 player. In fact, any music player with the standard 3.5mm jack is compatible with this boombox. Compartment: Once you have connected your music player to this boombox, you can place it in the back chamber. Afterward, you are now free to take this boombox wherever and whenever. Flashing lights: Yet another feature that adds character and fun to this boombox is its flashing lights. These lights dance along with the music. Portability and easy storage: This item weighs only around 1.1 pounds, which means your child can carry it easily wherever he goes. Additionally, it also very easy to store as it only measures 2.6 by 9.5 by 9 inches. 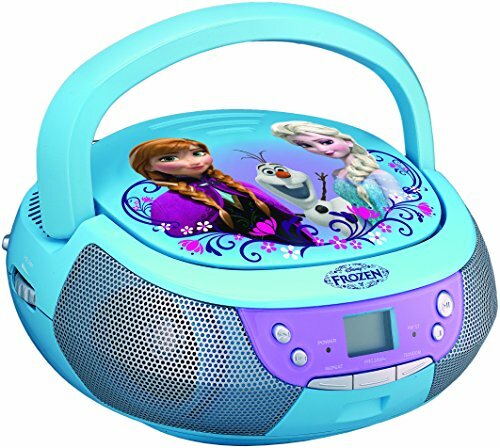 All in all, the Disney Frozen Anna & Elsa Sing-Along Boombox with Microphone would be a wise investment especially if your child adores this sister-duo. The real, working microphone would help them practice and hone their singing talents while the flashing lights further stimulate their eyes. The back compartment would ensure that the iPod or any MP3 player connected to it is safe and secured from any outside element. Really, all you need is three AA batteries, and you’re good to go! 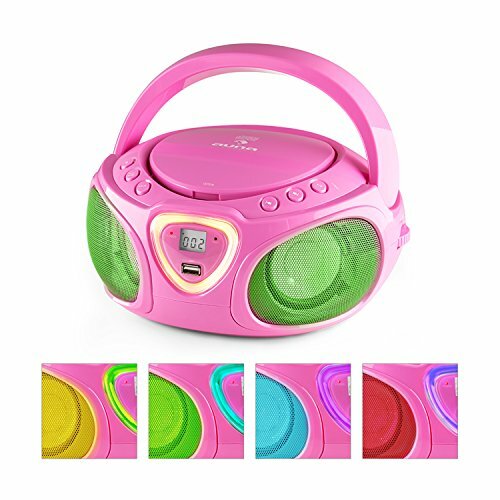 Your child can also effortlessly carry this boombox anywhere she goes because it’s made of lightweight materials put together in a compact design. The only setback that this boombox has is its very limited connectivity option. It comes with one regular 3.5mm jack. It will have been better if we are given the option to connect via Bluetooth or USB slot. The Auna Roadie Multi-Color Boombox aims for more than just providing a remarkable audio experience. It is also specially designed to look appealing to the eye. Unlike other boomboxes for kids that are designed with the faces of whichever cartoon character is popular at the time, the Auna Roadie Boombox boasts a simple yet classic look. Cordless or plugged-in option: With Auna Roadie Multi-Color Boombox, you can choose to have it powered by batteries or plugged-in a wall socket. Either way, it delivers an unmatched convenience to the user. This boombox runs on six type-C batteries and has a 110V to 120V electrical plug. Speakers or headphone jack: Whether you plan on hosting a house party or just chill out and listen to your favorite songs alone, this boombox has got you covered. It comes with two 1.5 W speakers, providing you with audio that is loud enough to bring fun and enjoyment to your party. On the other hand, it is also equipped with a headphone output for those times when you want to enjoy your tunes without disturbing the neighbors. Versatility: Similar to the boomboxes of the past, the Auna Roadie Boombox is equipped with a CD player on the top that can play CDs, CD-RWs, CD-Rs, and MP3 CDs. Additionally, it also has a built-in AM/FM radio and a collapsible antenna that allows it to connect to various radio stations. You can also choose to play your music via the USB port or Bluetooth connection. Portable: Weighing no more than 3.4 pounds, you can easily carry this boombox around to bring the party with you anywhere and anytime. It has overall dimensions of 7.9 by 9.5 by 5.2 inches, making it easy to store as it does not take up a lot of space. LED multi-color play: This boombox is the perfect companion to any party as it comes equipped with multi-colored LED lights that dance along with the rhythm of the music—for what is a party without flashing lights, right? When it comes to modern-day boomboxes, it’s all about connectivity and versatility. These are precisely what you will get when you buy the Auna Roadie Multi-Color Boombox. First, it boasts the combined audio power of two 1.5W speakers. Second, it can either be battery-powered or plugged-in. Next, you can play music from various sources such as a CD, flash drive, MP3 player, or via Bluetooth. Lastly, it comes with flashing lights in multiple colors that would take any party to the next level. Yet another boombox under the global brand eKids is the Minnie Mouse Bowtique Boombox. This company is among the leading brands in the electronics industry, which means that their products are safe and high-quality. You can also rest assured that the boombox you are getting is worth the money that you paid for it. Voice changer: One of the most notable things about Minnie Mouse is her unique voice. And if your child wishes to sound like Minnie, then now is her chance! This boombox is equipped with a voice changer that transforms any voice and turns it into Minnie’s. Imagine all the fun the whole family can have! Connectivity: This boombox is equipped with the standard 3.5mm audio jack, allowing you to connect any MP3 device. In that way, you can create your own playlist and play it for everyone to hear using this MP3 speaker. Storage compartment: This boombox is designed with a storage compartment at the back to keep your music player safely away from the elements. In that way, you can be sure that your iPod or MP3 player is safe even when you are on party-mode. Flashing lights: Another added feature of the Minnie Mouse Bowtique Boombox that is worthy of recognition is its set of flashing lights in multiple colors. These lights dance along with the music, turning any dull party into a memorable one. Real microphone: Similar to the previously reviewed boombox from eKids, this one also comes with a real, working microphone. Your kid (or you, we don’t judge) can use it to sing along to her favorite tunes. Alternatively, the microphone also works even without music. For everyone out there who are obsessed with Minnie Mouse, this boombox by eKids would be a great addition to your growing collection. It comes in a cute pink and white color with a large bowtie in the center, much like what Minnie wears. Overall, this item measures 14.1 by 10.9 by 4.8 inches, making it very easy to store. It is also very lightweight. It comes equipped with a real, working microphone that can be used with or without music. Additionally, it is designed with lights that flash along with the rhythm of the music. Once you have connected your MP3 player via its standard audio jack, you can place it safely in the storage compartment. 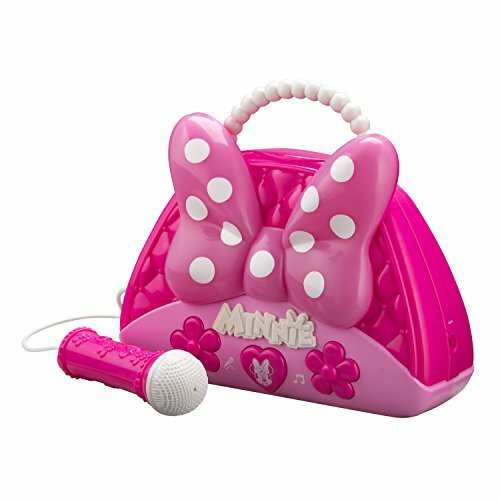 Lastly, you and your entire family can play with its voice changer, which turns any voice into Minnie’s unique sound! How exciting! 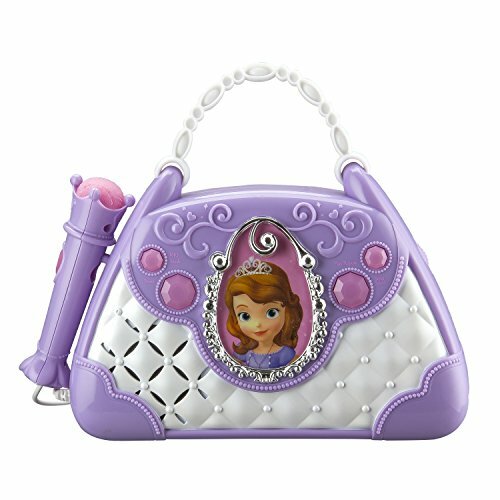 Is your child an avid fan of Disney’s Sofia the First? If yes, then this sing-along boombox would be the perfect gift for her. This boombox looks a little bit similar to all the other Disney boombox models that we have presented here. The only dissimilarity is that this one features Sofia the First! It also comes in a beautiful lilac color that your little girl will inevitably fall in love with. Built-in tunes: This boombox has Sofia’s top three favorite tunes such as Anything, Rise and Shine, and True Sisters. Your child can choose to listen to it all day long or sing along with it using the microphone. Real working microphone: If you wish to practice your child’s singing skills, then this boombox is the perfect tool to do it. It comes with a microphone that looks just as fancy as the boombox itself. MP3 compartment: We know kids can be quite reckless. To protect your MP3 player from their unforgiving hands, this boombox comes with a storage compartment that is specifically added for the safety of the music player. 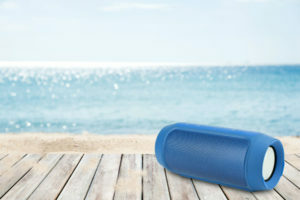 Connectivity: With this boombox, you can connect any music player with a standard 3.5mm audio jack without much effort required. It also comes with easy-to-understand controls that even your child of four years can handle. Portable and cordless: The only thing you need to get this boombox going is three pieces of AA batteries. Put them in their designated slots, and you’re good to go! No more hassle of finding a wall outlet to plug it in—convenience at its best. Every Disney Junior fan probably knows who Sofia the First is, and if your little girl is one of them, then you might want to buy this boombox for her. It is suitable for children as young as three years old. It comes with a microphone that she can use to sing along to Sofia’s favorite tunes. This boombox runs via three AA batteries, which are already included in the package. This one is designed so that it be compatible with any MP3 player with a standard 3.5 mm audio jack. It might look like a fancy little bag, but it is actually a speaker that produces quality sound. One major problem that this boombox has, however, is that you cannot adjust the microphone volume. It also does not have any AM/FM radio feature as well as any other connectivity option aside from the audio jack. Yet another collector’s item is this Frozen FR-430 Boombox with Microphone. It comes in a much more sophisticated look compared to the first Frozen-inspired boombox we reviewed earlier. All in all, it weighs 2.65 pounds and measures 8.5 by 8 by 4.2 inches. The following are its most notable features. Quality speakers with a microphone: Like the other boombox models that we presented earlier, the Frozen FR-430 also comes with a microphone. However, this one boasts a much more refined and classy look, perfect for older fans of Elsa and Anna. It is also equipped with two speakers (one on each side) that produce high-quality audio. Similar to any other microphone, though, you have to make sure that it is kept away from the speakers when it is turned on, or else you will hear a loud, screeching feedback. AC- or battery-powered: With your convenience in mind, this boombox is designed to be either plugged into an AC socket or operate via a set of six C batteries. In that way, you can take the party anywhere you wish to go. 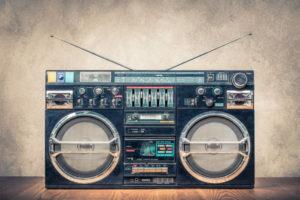 FM radio: With this boombox, you can stay connected and updated with the latest news and most popular hits without the need for an internet connection. It comes with a built-in FM radio and an adjustable antenna to receive radio reception anytime, anywhere. 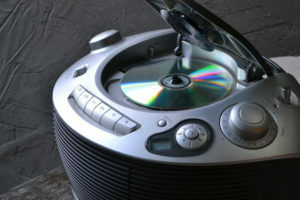 CD player: In addition to FM Radio, you can also go old-school and listen to your favorite tunes using the CD player. Like the radio, it is also built-in and located on top of the boombox itself. It comes with easy-to-operate controls, too. Standard aux-input connection: If the combined prowess of the CD player and FM radio is still not enough for you, then you may choose to connect your music player via the aux-input connection. It supports any MP3 player that is compatible with the standard 3.5 mm audio jack. Alternatively, you can also purchase a connector if your music player is not compatible with it. LCD screen: Adding to its overall appeal is the LCD screen that displays whether you’re connected via aux-in, listening to a CD, or in radio-mode. This boombox is a versatile device that combines the power of FM radio, CD player, and MP3 player into one little machine. It also comes with a microphone that you and your child can use to sing along to your favorite tracks. 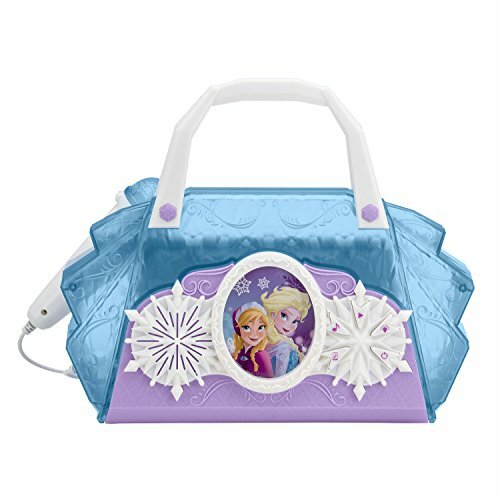 This one looks like a grown-up version of the other boombox models we have discussed above if not for the Anna-Elsa-Olaf picture that is printed on top of it. Nevertheless, it could still be the perfect boombox for Frozen fans of any age. 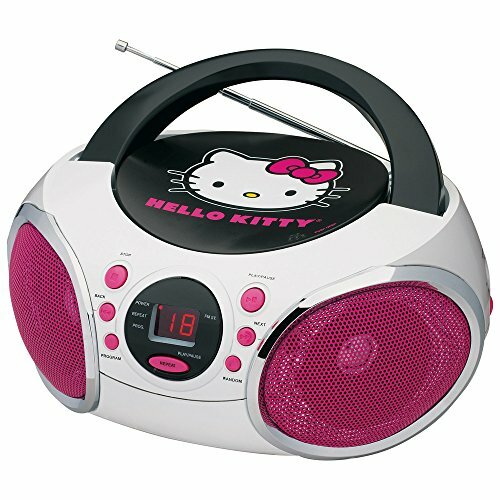 Completing our list of the top six best boomboxes for kids is the Hello Kitty KT2026-MBY. For all the Hello Kitty fans all over the world, this one would be yet another addition to your collection. This item weighs no more than 3.6 pounds and has measurements of 11.5 by 9.5 by 5.6 inches. Its most notable features are listed below. LED screen: For your convenience, this boombox is equipped with an LED screen that displays the media type you are currently on. This just means that you can quickly switch from CD player to AM/FM radio to Aux-Input. CD player: In this world full of digital everything, you can use this boombox to listen to your favorite CDs! 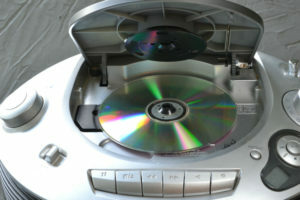 The built-in CD player is compatible with all CD-R/RW discs. Built-in antenna for am/fm radio: With this boombox, you don’t need to be connected to the internet to know the latest hits and news. You can just simply turn it on, scan for your favorite radio station, and you’re good to go! Standard aux-input connection: Of course, it is not enough that you are able to listen to the radio or play your favorite CD tracks. This boombox also allows you to connect any kind of music player with the standard 3.5 mm audio jack. Dual speakers: This boombox is equipped with a powerful speaker on both of its sides, providing you with audio quality that is worth the money. Runs on AC or batteries: Staying true to the original purpose of boomboxes, this model can run on either AC or batteries. This means that you can take it with you anywhere you go—be it in your friend’s house or at the beach! Lightshow: Another added feature of this boombox is its flashing lights. Whatever genre your music is from, the lights will adjust to it to provide you and your entire party with a mesmerizing show. All in all, this product would be an excellent gift for children and young-at-hearts who are avid fans of Hello Kitty. It boasts the functionalities of an AM/FM radio combined with a CD player and music player. Additionally, it also has dual speakers that are sure to produce a rich sound. This boombox functions either on batteries or plugged into a wall socket. Either way, you can take it with you anywhere you go and host an impromptu dance party whenever. Additionally, the remarkable light show automatically adjusts to the kind of music you are listening to, which means it can both be relaxing and full-on party mode depending on your needs. Looking at all the features and functionalities of each of the products presented above, we have concluded that the best boombox for kids that would give you the most bang for your buck is the Frozen FR-430. This is because, among all the other boombox models, the Frozen FR-430 is the only one that has all the functions of a CD player, radio, MP3 player, and a microphone. The Hello Kitty KT2026-MBY, on the other hand, comes at a close second. While it too can function as a radio, MP3 player, and CD player, it does not come with a microphone. Nevertheless, it still would be a good investment, especially for individuals who are obsessed with Hello Kitty. Awesome article! I too have experienced the many joys and benefits of music, and particularly growing up with a portable boombox with TWO tape decks, mic input, and CD player haha. I hadn’t really considered the way these are really well suited for children due to the ease of operation and the ability of parents to regulate content a bit easier than on a streaming service. I agree that music is one of the most positive influences in life and especially teaches us as we grow up a wide variety of life lessons. I like the way you’ve detailed the pros, cons, and various features of the boomboxes. Really palatable and useful for the prospective purchasing parent. It hadn’t really occurred to me that it could also be a great, empowering tool to teach children responsibility of taking care of something while also giving them some freedom to relax and enjoy the music they want to listen to. You’ve done a really nice job of thoroughly explaining each model, it’s various features, and its pros and cons. Just curious if you have any suggestions for boomboxes for adults? I currently have a pretty nice home sounds system but would definitely be interested in getting a classic style boombox the bring camping or to enjoy music outdoors with friends. Thanks for the compliment Connor. I suggest you look around on the site and you’ll find many other options. For example these waterproof boomboxes. I loved this article, we are quite a musical family and my son absolutely loves all types of music so I really enjoyed reading your article and found it incredibly well written. I especially loved your cons for buying them a boombox, I think a lot of parents can relate to being forced to listen or watch things we rather not listen or watch.